This is one of several Christmas stories in my memoir. 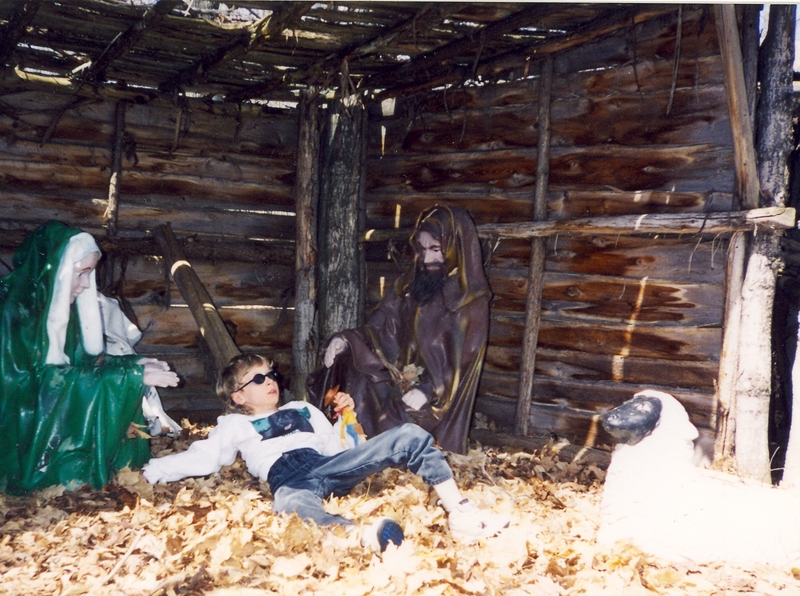 Near Kalkaska we found this Nativity Scene and laid Noah down as a baby Jesus stand-in. He wasn’t happy, but couldn’t get up and get away. This photo has nothing to do with this story, but I like it. Noah loved Christmas and we fueled his passion with our own holiday hype. We’re super hall-deckers. There’s not a surface in our house that doesn’t have some piece of Christmas crud on it. Elves on shelves. A manger scene with a menagerie. In the bathroom a rooftop Kleenex box topper with a pulled tissue looks like chimney smoke. A bobble head Santa. Angels in high and low places. A super-groovy Christmas red wax lava lamp. We set up miniature figurines of the entire cast of Rudolph the Red Nose Reindeer accompanied by a large, animated Bumble with stiff white fur. Central to our celebration is a big, lit like Tokyo at night, fully-ornamented, set-up-the-day-after-Thanksgiving-until-Epiphany-or-St. Knut’s Day-fake tree. At our house, Christmas is never a day, but a season. Shortly after his late September birthday, Noah began his Christmas quizzing. For years we played along. Mike and I liked the innocence and the imagination that surrounded Noah during the holidays. Even when he was in the third grade and someone told him (again) that there was no Santa, we acted shocked. “If you want to believe in Santa, that’s okay. Dad and I do, and you can too. You don’t have to go along with the kids at school. Believe what you want to believe.” Noah was a little naïve, a little too trusting of his dad and I. He was born with cerebral palsy and relied on us, not only for his mobility and day-to-day care, and for much of his life information outside the classroom. Sometimes the worldview we provided was laced with imagination and irony. Noah seemed suspicious, but was hesitant to question us too strongly on the chance of jeopardizing his relationship with Santa. “When can I go see Santa?” he asked me at Halloween. “That’s going to be awhile,” I said. “You have all of November and some of December. You don’t want to go too early because Santa could forget and you don’t want to go too late because he might be out of things. We have to time it just right,” I said. Noah held me to that date, checking the days on the calendar after Thanksgiving. 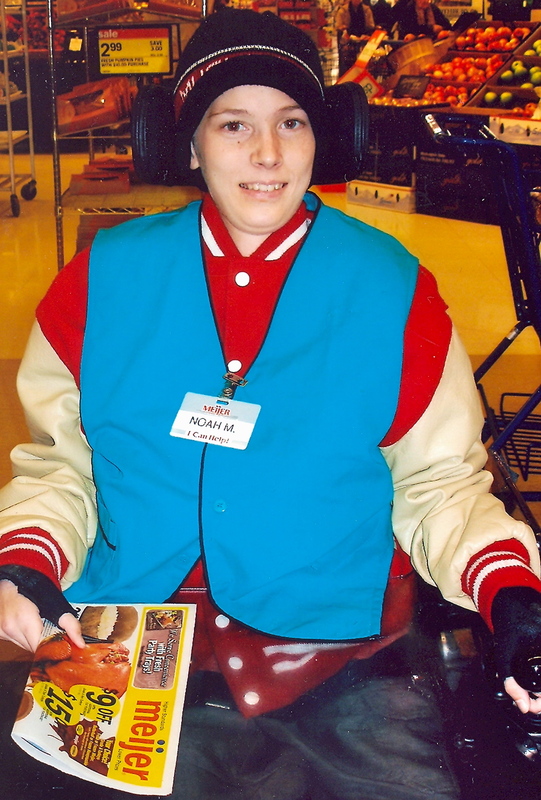 We’d see Santa out and about while shopping and he’d crane his neck as we wheeled by. “Now? Can’t we go now?” he said. “Well, then. There you go. No need to see Santa today. Let’s get that list in shape,” I said. We didn’t make a paper list. We just talked about the things Noah wanted and needed, and his job was to remember the list when he finally got to see Santa. “It’s more sincere that way,” I told him. “Buzz Lightyear. Talking Woody. Racecar set. Charlie Brown DVDs,” he recited, working on his memorizing. “All good stuff. How about some pajamas? A new jacket? How about some underwear? You can always use underwear,” I teased. “No underwear,” he said. “I’m not asking Santa for that,” he said with disgust in his voice and a wrinkled nose. The Saturday we headed to visit Santa was cold and clear, unusual for West Michigan which tends to be gloomy in the winter. The sun was out and there was a thin layer of new snow on the ground. We bundled Noah in a jacket and mittens and loaded him and his wheelchair into the back of the van. “Are you ready to talk with Santa?” I asked. “Don’t be. It’ll be fine. Just remember your list. And be polite,” I said. He looked nervous; his face was flushed and slightly sweaty. Perhaps I’d put too much pressure on him with memorizing the list and all. “Dad and I’ll be there with you. There’s nothing to be concerned about,” I said. As we stood near the mall’s North Pole chalet, an authentic-looking Santa motioned toward us with a white-gloved hand. We looked around, up and down the line, not quite knowing for sure who was getting the wave. Santa sent a helper to fetch Noah. She smiled and we pushed on up to Santa. He came down from his Santa chair and knelt close to Noah, putting his arm around the back of the wheelchair asking his name. “Noah,” he whispered. Santa’s hearing must have been excellent. Noah paused. His eyes gazed heavenward as he worked to recall his list, he bit his lip, his hand clenched and relaxed. A long stretch of seconds passed. It felt like hours to Mike and I.
Santa looked surprised. Mike and I laughed. Noah blushed and looked at his feet. “That’s a good thing to want for Christmas,” Santa said. He was trying not to laugh. “I’m sure my elves can find some other presents for you, too,” he said. “Wait, we need a picture of this young man with me,” he said. He wheeled Noah over near the painted backdrop of pine trees, a glowing cabin and snow. “On the count of three, smile,” said the photographer. With confidence he smiled, knowing, believing that Santa would take care of him.